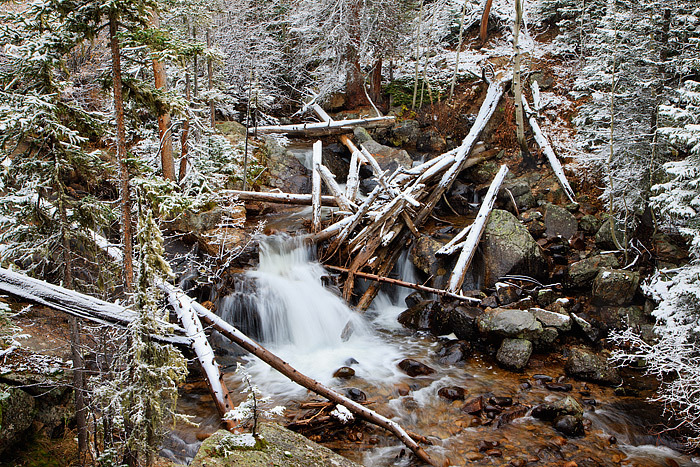 North Saint Vrain creek tumbles through downed trees in the Wild Basin area of Rocky Mountain National Park. The North Saint Vrain is about to join up with Cony Creek as they flow eastward. This small unamed waterfall is still freely flowing even as snow falls on the rocks and trees along the banks of the creek. Photo © copyright by Thomas Mangan.